One thing that I love about fall are all the beautiful fields of sunflowers. So they became the inspiration for this fall glitter house. If you have been following me on other glitter house posts you know that I start with a paper mache house from Hobby Lobby. 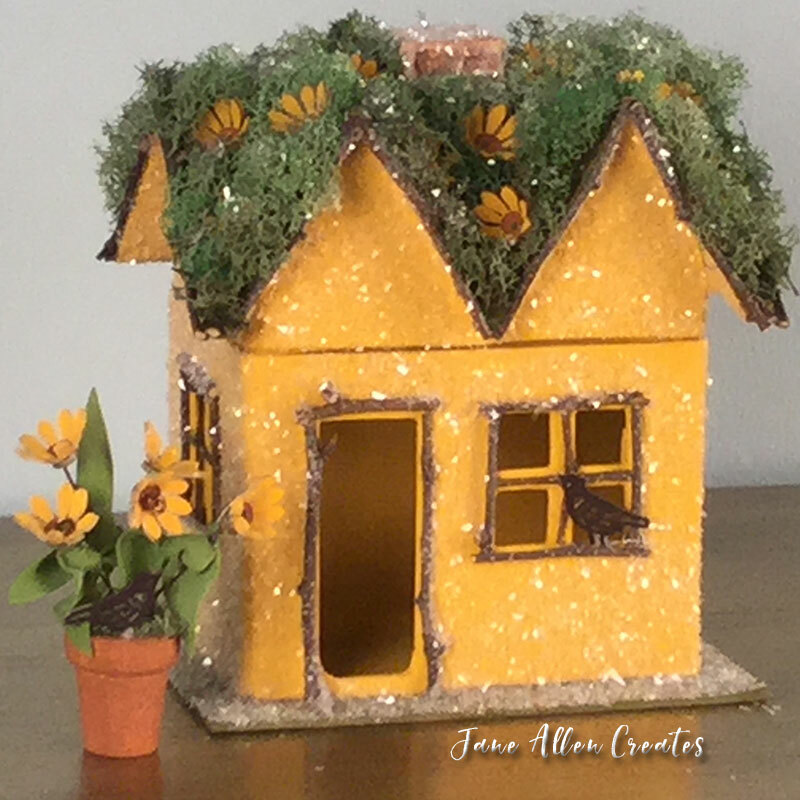 This is the small house which I base coated ( I use all DecoArt paints in this project) Marigold. The roof and grass are Antique Green and the chimney is Toffee. Also, while I was at it, I painted some shrink plastic with Marigold, Soft Black and Antique Green. I used the Frosted Ruff and Ready Shrinky Dinks which you can also get at Hobby Lobby or Micheals. I painted on the matt side of the Shrinky Dinks. I then painted the chimney to look like stone and glued some moss to the roof. My idea was to have sunflowers on the roof so I decided to make them out of shrinky dinks. I used punches to cut out the flowers (about 1 3/4″). I also cut out 5 green circles (about 3/4″) that I am going to use for some sunflowers in a pot. Just as I was working on this project my friend Amy Mogish sent me a bird punch so I thought it would be fun to add a few black birds. Punch 1/8″ holes in the center of the flowers and circles. Once the flowers were cut out I painted the centers with Raw Sienna. Now the fun of shrinking the shrinky dinks. I used a heat gun and the dome mold by Julie Haymaker. You can find out more about it and actually watch an action video on this post – How to Make Shrinky Dink Earrings. Basically you use the heat gun and shrink the plastic until it lies flat, then press with the dome tool. Some flowers I wanted to be more open so I did not push the dome tool down the whole way. Once the flowers are done I used my glue gun and glued them to the roof. I did save five to place in a flower pot. I cut a piece of 20 gauge brown wire about 6 inches long and created a little swirl in the top with my round nose pliers. I then folded the top over slipped the flower on the wire and then slipped the green circle on and glued in place. I wanted to put some leaves on them so I used some long leaves from some other silk flowers and just tied them on the wire and glued them in place. If I did it over I would just use a few pieces of ribbon. These leaves were made of plastic and kept stretching so I could not get a tight knot. I then put a little oasis in a small wooden flower pot that I painted Raw Sienna and made a little arrangement. I also glued a bird into the pot and one on the windowsill. More fun now, by adding glitter. Basically work an area at a time adding white glue and then sprinkling on glitter. Shake off excess. On the roof I just dabbed my sponge brush with white glue on it here and there on the roof and then added a little glitter. The glitter is just magical. I love how it transforms the little house. I hope you are encouraged to create a few glitter houses for fall. I will be sharing very soon my other fall house that I created with the help of my friend Daniel. Beautifully done….love the flowers. I’m with Effie….off to buy shrink dinks… :). PS,,,,love the birdie! Thank you Amy, shrinky dinks are addicting. Your punch came the day I was working on the project and the little birds worked out perfectly. Thank you my friend. Oh how fun! I definitely need to try one! I just found your blog and looking forward to looking through all your projects!